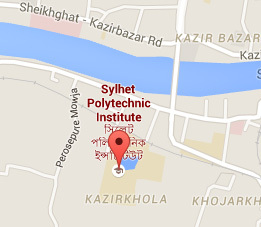 Civil Engineering Department of Sylhet Polytechnic Institute was started in the decade of 60.In the early days student capacity was only 40 nos. but now a days it consists of 96 students (in two different group A & B).To serve the nation and to accelerate the education rate there is another shift of students (evening shift) which consists of the same number of students. So every year in two section/groups (A+B) 118 students enroll here. One head of department (chief instructor) leads this Department and six qualified teachers. We have four laboratory/shops for demonstrating practical works :- masonry and plumbing shop, surveying shop, wood working shop, and soil shop. These shops are well- equipped and four experienced craft instructor/ lab assistant are engaged there. The students are guided by the Bangladesh Technical Education Board, Dhaka. We follow BTEB prescribed 4 year diploma engineering syllabus which has eight semester. Each semester’s duration is six months.